Warehousing your inventory is much more than just storing boxes! Medallion Fulfillment & Logistics has the warehouse resources to handle any of your warehousing need. We maintain two warehousing facilities in Chatsworth, California (part of Los Angeles County) and one facility with unlimited warehouse expansion space (up to 1,000,000 square feet) in the downtown Los Angeles area near the Port of Los Angeles. 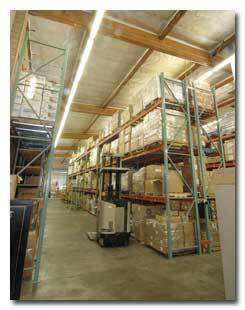 We do provide special temperature controlled warehouse environments, as well as regular warehousing. For those clients that don't need special cooler warehousing space, the climate in Los Angeles is mild in nature with an average annual temperature of only 63° Fahrenheit. Based on our location, you may not need to consider a climate controlled warehouse environment for your merchandise, but if you do, we have special space available for your needs. Whatever your need is, big or small, shelved, containerised or on pallets, we have it available and waiting for you. Overflow space for your merchandise is always available. Don't ever be worried about warehouse capacity or storage space when you work with us at Medallion Fulfillment & Logistics! Our technologically advanced and custom designed computer systems maintain a complete inventory of your products. We can also handle product and part reorders for you, keeping your supply chain filled and orders flowing smoothly. When you have us manage your supply chain and process parts and merchandise reorders, you establish our ordering quantities so that you are in complete control of your financial decisions at all times. We work to make the supply chain management of your merchandise efficient and worry-free allowing you to focus on the marketing and selling of your products and merchandise. We take the security and protection of your merchandise seriously. We have invested in 24 hour monitored security video cameras and 24 hour armed guard security alarm system response with intrusion detection triggered by motion detectors. The Medallion Fulfillment & Logistics staff is bonded for added security and protection of your merchandise. Additionally we have an internal high security area in our warehouse for the storage and processing of high dollar items for even more security. In over 25 years in business, we have never had an internal or external theft problem. We carry insurance on the warehouse buildings, but you will need to properly insure your merchandise when we warehouse it for you with a separate policy. We also recommend that you consider and carry product liability insurance. If you need assistance procuring insurance for your merchandise, let us know we may be able to help you under our special umbrella policy for a fee. 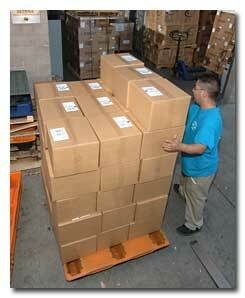 We can receive your merchandise in most any form: cartons, pallets, containers... you name it. When we receive your merchandise, and are notified in advance of what we will be receiving, we will prepare a receiving report. We will verify the receipt of your merchandise by carton count or individual product count based on your request and contract. The receiving report is then input into the Medallion computer system along with the bin and warehouse location, keeping our computer records accurate and up-to-date. All receiving reports are emailed to you. We have the resources to receive containers from your overseas broker and get it moved from the dock, inventoried, and stored in our warehouse facilities quickly and efficiently. We can even handle the details of getting your merchandise through customs. Whether you are exporting or importing merchandise, we have the expertise and tools available to help you navigate the processes efficiently. We want to be your global fulfillment resource! We provide cross docking services to small to large businesses and other fulfillment firms as their sub-contractor. We can even pick up your overseas container after it has cleared customs. In our cross docking operation, we will break down your container and ship your orders out in a 24 hour period. We provide fast turn-around, cost efficient services, and careful order processing. If you are a fulfillment firm looking for a "service partner" to contract out your cross docking needs to, we can provide the flexible and fast turn around that you need. Contact us for more information. Returns are a part of every business, whether a return is for a product that was damaged in shipping, something that the customer did not want to keep, or an item returned as defective, we can handle all of your merchandise returns. In advance, you will communicate parameters to us that will make up your individual return policy. When we are notified of a return, we will prepare an order return form indicating the reason, who returned the item, who authorized the return, the condition of the returned merchandise, and advise you if the item can be returned to stock, repackaged and resold, or has been set aside for your decision for a course of action if it is unusable or damaged. We will email you a copy of the return form. If we are processing your credit card transactions, we will refund the merchandise amount to the customer minus the shipping fees, unless otherwise advised, on a timely basis.